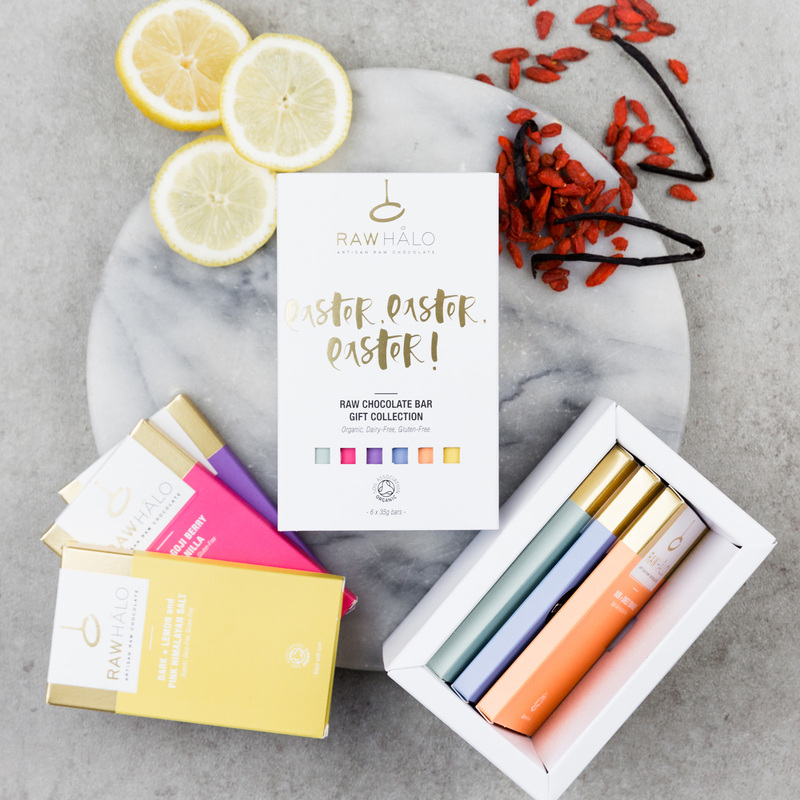 Give the gift of delicious raw chocolate this Easter. A healthier way to enjoy chocolate, smooth and fruity peruvian raw cacao is sweetened with organic coconut sugar - ensuring each bar is glowing with goodness. A delicately gold embossed Easter themed gift box contains 6 x 35g bars of award winning chocolate, which is organic, raw, vegan friendly, gluten free and containing no refined cane sugar. Mylk + Crispies 35g Bar Raw cacao butter*, coconut sugar*, buckwheat* (17%), raw cacao powder*, cashew nuts*, lucuma powder*, inulin powder*. *Certified organic ingredients. Cocoa solids 46%. Pure Dark 35g Bar Raw cacao butter*, raw cacao powder*, coconut sugar*. *Certified organic ingredients. Cocoa solids 76%. Dark + Sweet Orange 35g Bar Raw cacao butter*, raw cacao powder*, coconut sugar*, orange essential oil* (0.2%). *Certified organic ingredients. Cocoa solids 76%. 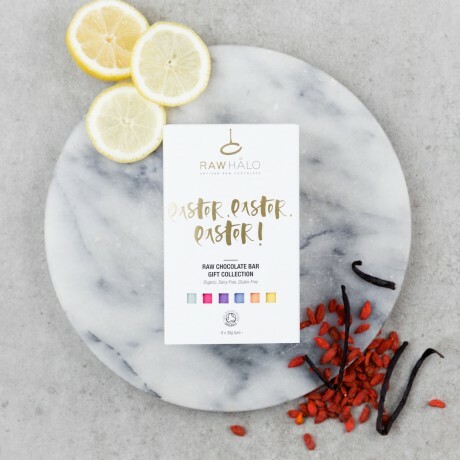 Dark + Lemon and Pink Himalayan Salt 35g Bar Raw cacao butter*, raw cacao powder*, coconut sugar*, pink Himalayan crystal salt (0.6%), pure lemon extract* (0.1%). *Certified organic ingredients. Cocoa solids 76% minimum. Mylk + Crispies 35g Bar Typical Values Per 100g: Energy 2263kJ / 545kcal, Fat 39.1g, of which saturates 23.2g, Carbohydrate 43.2g, of which sugars 18.8g, Protein 6.7g, Salt 0.2g. Pure Dark 35g Bar Typical Values Per 100g: Energy 2334kJ / 563kcal, Fat 44.0g, of which saturates 28.3g, Carbohydrate 32.4g, of which sugars 21.6g, Protein 9.8g, Salt 0.2g. Dark + Sweet Orange 35g Bar Typical Values Per 100g: Energy 2334kJ / 563kcal, Fat 44.0g, of which saturates 28.3g, Carbohydrate 32.4g, of which sugars 21.6g, Protein 9.8g, Salt 0.2g. Dark + Lemon and Pink Himalayan Salt 35g Bar Typical Values Per 100g: Energy 2334kJ / 563kcal, Fat 44.0g, of which saturates 28.3g, Carbohydrate 32.4g, of which sugars 21.6g, Protein 9.8g, Salt 0.7g.